Speaking of Justin, I just realized that I had posted this over on Sugar Frosted Goodness back in March, but never posted it here. 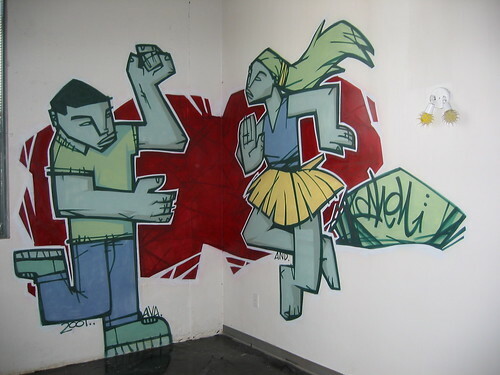 It's some graffiti characters I painted for Justin for his loft in Cabbagetown Mill Lofts, deep in the heart of Atlanta. 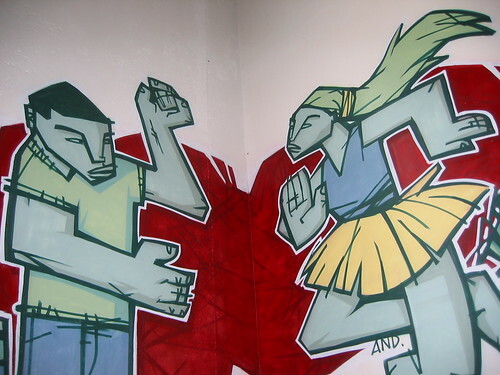 The two dancers were painted in 2001, over the course of a long weekend. The leftover fumes were so bad at night that Justin had to sleep somewhere else for a couple of days for fear of passing out. I wore a respirator when I painted the wall, making sure that I didn't pass out, didn't see pink elephants on parade, or at the very least make sure that my next child didn't have a third arm. When Justin moved out in 2003, another fellow Primate (what we Primal Screen employees call each other -- cute, huh?) Brandon moved in with his girlfriend, vowing to keep the mural up. Alas, Brandon eventually moved out in November of last year (when these pics were taken), so who knows if the current resident has kept it up? Oh well. It had a good run. 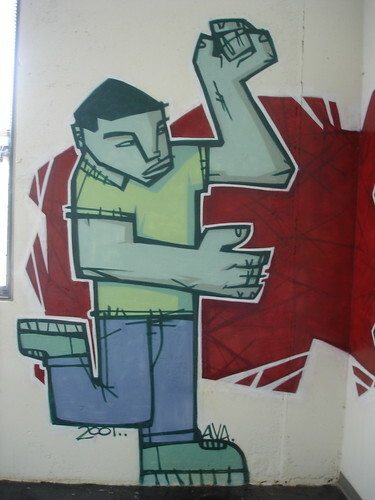 I really enjoyed working on this wall -- it was my first graffiti job inside a building. As typical per any artist, I see some things that I would go back and fix, like proportions, poses, line quality, etc. But ah, why bother? Gotta get over it. It was fun, and I learned some valuable lessons -- like for example: lofts don't have very good ventilation. Keep that in mind whenever you get the urge to spray paint the walls of your loft apartment. I sure miss that graffiti...and I'm sure Brandon does too. Thanks, guys! Yesh, Justin, I miss checking it out. Oh well. So goes the typical graffiti piece -- fleeting and then it's gone. Thanks for letting me have the chance to do this, Justin. It was loads of fun!